This children's picture book is in te reo Maori. It includes a CD with songs. 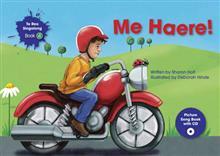 No prior knowledge of te reo Maori is required by the children or adults using this book. The story and song are about vehicles and colours with phrases such as I am going by orange truck . Listening to the song while reading the book will help readers match sounds with words and actions. The book contains a pictorial glossary, English lyrics for the song, guitar chords and a list of extension ideas for parents and teachers. This book is the fourth in the te Reo Singalong series. Sue McCandlish: Keep up the good work Sharon! Your latest book, Me Haere, is so popular with the children. They always ask: Can we have Sharon's motorbike book? Yay!